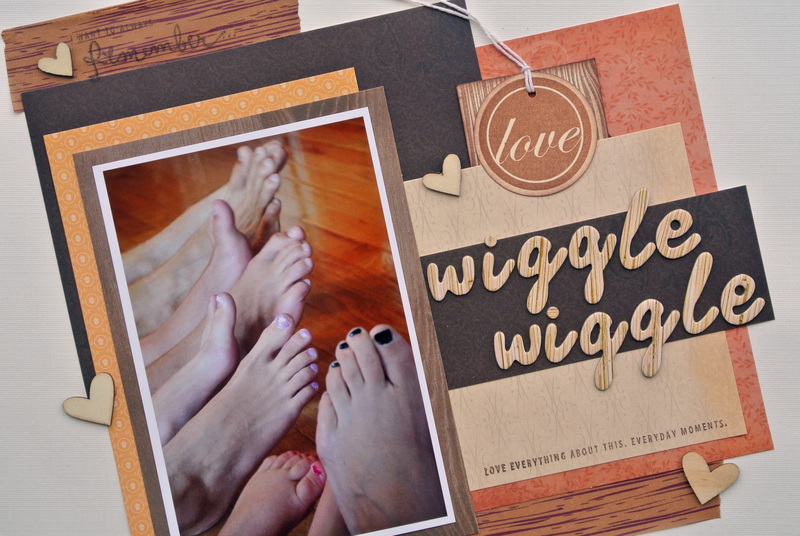 Did you know that August 6th is Wiggle Your Toes Day? I didn’t either until a friend posted this morning on the Cricut Circle Message Board about all the fun holidays that most of us have never heard of or even thought to celebrate. She even challenged us to not only celebrate it, but to document it as well. So, this afternoon after a long day at work we had a little piggy wiggling time in the Andrews’ house. I used the new DCWV the Autumn Melody Matstack available at Jo-Anns. I love the warm Fall colors and thought they would be a perfect match for the wood and skin tones in my picture. I know this is totally silly, but who couldn’t use a bit more silly in their life? And I’ve already made a list of the other fun holidays that we will be celebrating. So if you wake up and find zucchini on your front porch, it was from me! ADORABLE.. Love how you embrassed this idea. OH and you can put zucchini’s on my porch anytime — only a few hundred miles away.. Great job loving all your layouts. Uh-Oh!!! Now I see where I went wrong yesterday…I didn’t know that it was “Wiggle your TOES” day & I spent the day just “Wiggling”…once I started wiggling, I couldn’t stop! This is a FANTASTIC layout…wonder if I can get my 2 to do this with me???! What a great layout! I wish I knew about this yesterday especially since it was the one night DH had off. What a great picture! Fabulous – the warm colors and the wood grained papers are perfect. Great photo – great layout – and wonderful! Totally impressed how you went from concept to execution! Cute photo, layout and title!